There has been an outburst of deal activity in European cable markets with Vodafone and Liberty Global squaring up on Spain’s Ono. Other European cable assets such as Com Hem, Get AS, and Galicia in Sweden, Norway and Spain respectively are reportingly also up for sale. Despite the economic woes in Europe and the regulatory uncertainty across the broader European telecom sector, valuations relative to the US have improved in 2013 returned to close to historical averages around 6 times EBITDA. The European incumbents are expected to see stabilisation, or at least a slowdown in decline, of revenue in 2014 and many are hoping that the environment is becoming more conducive to the long predicted European consolidation. Against this background, I had a quick look over COLT Group SA, previously COLT Telecom, one of the start-up pan European telecoms from the heady days of the telecom bubble in the late 1990s/early 2000s. A previous post on the telecom sector touched on the past of COLT and the graph below shows the firm’s operating history to YE2012 and illustrates the pressure on cash-flow (e.g. EBITDA less capital expenditure) as a result of the changes COLT have undertaken since the mid-2000s to focus on being a pure pan-European data and managed services provider. 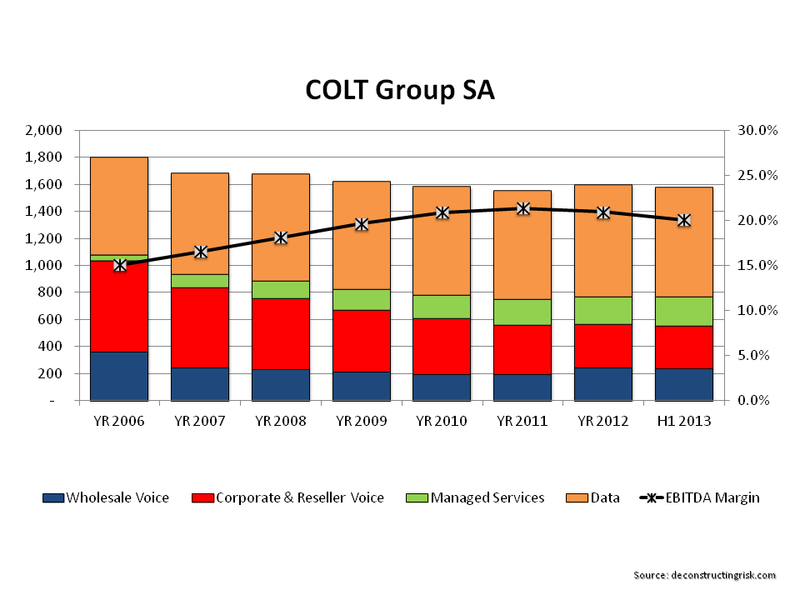 Digging a bit deeper, the breakdown of revenue by source shows that COLT has been making progress in reducing their exposure to lower margin voice revenues. However, annualising H1-2013 results shows that progress on EBITDA margins has slowed in the highly competitive sector and that returns on investment have yet to materialise operationally in a significant manner. COLT is debt free but cash has reduced to €160 million as at Q3 (from €280m at YE 2012 & €340m at YE 2011) due to data centre infrastructure expense. COLT’s valuation, at below 5 times EBITDA, is less than many in the sector and also below recent acquisition multiples such as Deutsche Telecom’s purchase of GTS Central Europe for approx 6.3 times EBITDA. 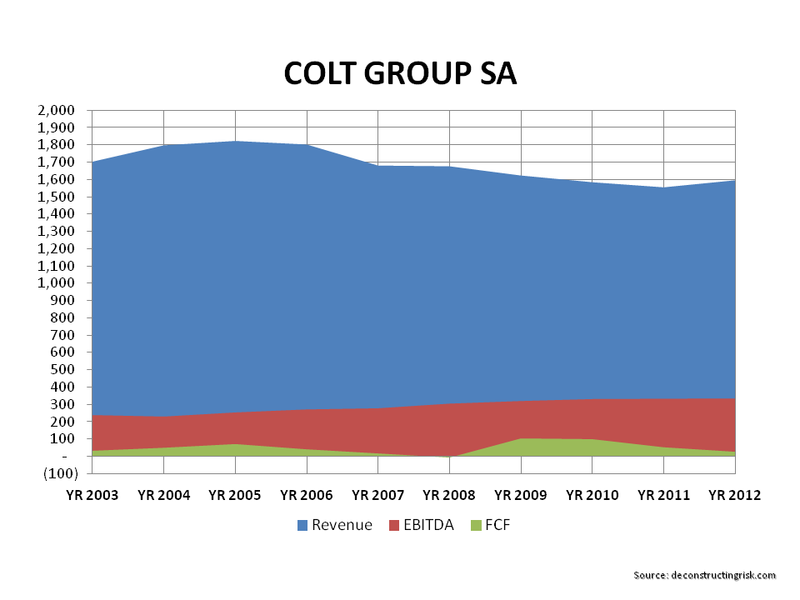 However, for me, recent sluggish revenue growth and EBITDA margins show that COLT still has much to prove in demonstrating the success of its investment in its strategy. On the upside, a firm like COLT may get caught up in M&A speculation with someone like Vodafone looking to buy fixed line assets in Europe. This entry was posted in Investing Ideas, Telecom and tagged acquisition target, COLT Group SA, COLT Telecom, data and managed services, data centre infrastructure expense, Deutsche Telecom, EBITDA less capital expenditure, European cable markets, European incumbents, European telecom sector, fibre telecoms, GTS Central Europe, highly competitive sector, pan European telecoms, regulatory uncertainty, telecom bubble, telecom consolidation, telecom EBITDA multiples, telecom valuations, vodafone. Bookmark the permalink.